The report uses New York as their reference to rank the rest of cities. According to The Economist, Singapore is the most expensive city in the world, 16% higher than the Big Apple, for the third year in a row. 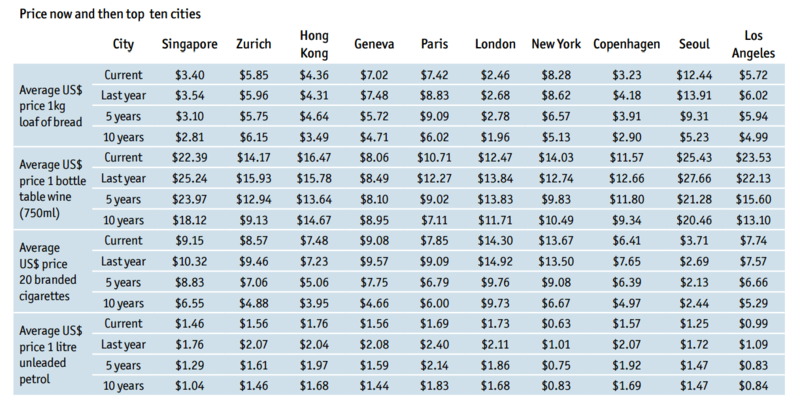 In the top five of the most expensive cities, Zurich takes second place, followed by Hong Kong, Geneva, Paris and London. New York City is ranked 7th, while Copenhagen, Seoul, and Los Angeles occupy the last few spots of the top ten. Let’s get down to the facts. A bottle of table wine averages $22.39 (US Dollars) in Singapore, while you can find the same product for almost half the price in Copenhagen ($11.57), Paris ($10.71) and London ($12.47). Geneva offers the cheapest wine among the top ten ($8.06), while Seoul might be the worst destination for wine lovers ($25.43). If after reading this you are thinking about sticking to homemade sandwiches, this might help. The best cities among the top ten to buy a 1kg loaf of bread are London ($2.46), Copenhagen ($3.23) and Singapore ($3.40). On the other hand, cheap, homemade sandwiches might turn into a fancy dinner in cities like New York ($8.28) and Seoul ($12.44). In the chart below, you can see how these prices have fluctuated over the past 10 years. Is The World Getting More Expensive? Given the fact that New York City was used as a reference to rank the rest of its peers, changes in its cost of living index affects the rest of the ranking. Just within the past 12 months, the Big Apple moved from 22nd place to number 7, mostly given to the strengthening of the US dollar against other currencies. According to the report, “All 28 cities surveyed in Western Europe have experienced cost of living declines compared with their US counterparts, highlighting the difference in recovery between the two regions.” The weakening of the Euro, as well as the Australian and New Zealand dollars, has pushed cities in those areas down the ranking, making them more affordable for international travelers. On the other side, the independence of Switzerland and its currency from the Eurozone has kept the country away from the austerity measures taken by its neighbors. This has kept its two biggest cities (Zurich and Geneva) as the two most expensive cities in Europe. The report also states that “A total of 106 cities have seen negative index movement compared with New York in the last year, in contrast with just 16 that have seen a rise in the relative cost of living.” This might be good news for all the backpackers and digital nomads out there. The Economist Intelligence Unit also highlighted the cheapest cities in the world. India was the biggest contributor to the bottom ten group, with four cities (including its capital and biggest city, New Delhi and Mumbai respectively) on the list. Venezuela’s capital, Caracas, immersed in one of the worst economic situations in its history, gets the crown as the world’s cheapest city. However, The Economist noted that “in Venezuela the adoption of multiple exchange rates has made pricing Caracas nearly impossible”. Although the official exchange rate is BsF10:US$1, this “remains unsustainable in the face of rampant local inflation”, which the IMF estimated will reach 720% in 2016. 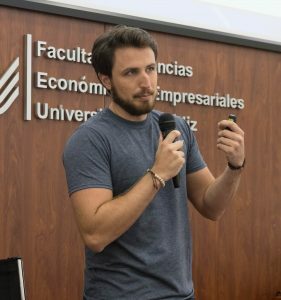 One of the issues that made pricing Venezuela’s capital almost impossible was the existence of a “parallel black market exchange rate trading at 100 times that of the official rate”, something similar to what happened in Argentina until its new President lifted the currency control over the peso last December. You can download the full report here and see where your next destination ranks. Safe travels!